Tyler Hoffmann is the Digital Marketing Coordinator for the Chamber’s Convention & Visitors Bureau where he develops and executes digital media plans across multiple channels to help position New Braunfels as a top tourism destination. You’ll find he is always up to date with the latest technology, creatively applying it to the CVB’s efforts. Among other distinctions in the field, Hoffmann works to educate and inform industry partners about digital marketing and communication best practices. He also works closely with the Texas Film Commission, Texas Travel Industry Association, and the Historic Museums Association. Hoffmann will celebrate 10 years with the Chamber in July 2018. He has worked his way up from the front lines, through other departments, to his current role with the CVB. Tyler is a graduate of the Chamber’s Youth (2005) & Adult Leadership programs (2011), and City University (2017). 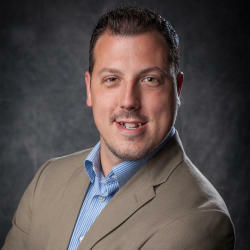 He holds coursework with San Antonio College, Wayland Baptist University, and is currently enrolled in Liberty University’s Master of Science in Marketing degree program. He has received his Tourism Ambassador Certification (2017) and is set to complete Tourism Executive Certification in 2018. As a 5th generation New Braunfelser, Hoffmann takes pride in his community. You’ll find him involved in many local and industry organizations. He is a founding member of the New Braunfels Young Philanthropists “NB Next”, the Mid-Texas Symphony “YES” group, and the Headwaters at the Comal. He has held statewide board positions, including InnoTech Conferences and the Devil’s River Conservancy. When Hoffmann isn’t in the office or at local meeting, you’ll find him and his partner Ben, relaxing along Texas’ most pristine river, the Devil’s River, reeling in redfish around Rockport, or catching a flight to Napa, Mexico, or Asia. A travel guru, he is always up for an adventure! What is one thing on your bucket list? To see the Galapagos Penguins. They are the only penguins found north of the equator and there are less than 2000 left in the wild. Who is your favorite super hero? Personally, I believe in “human” heroes. Being a two-time cancer survivor myself, one of my heroes is Scott Hamilton. If you could go on a free vacation, where would you go? See Question 1.